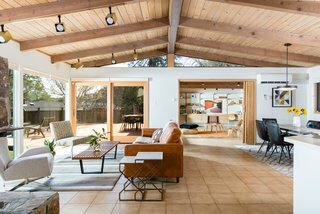 Built in 1956, this modest midcentury conveys the charm of its era with vaulted wood ceilings, lots of glass, and a hefty stone statement fireplace. 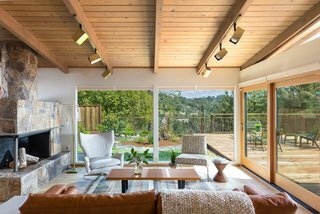 Located on a quiet lot in Orinda, CA, just a 20-minute drive from Berkeley, this 1,704-square-foot home features a fluid, open-concept living area capped with tall wood ceilings and clerestory windows. Three bedrooms and two baths round out the floor plan, which is kept to a comfortable single level. 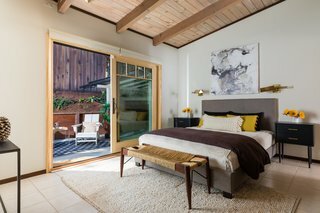 Sliding glass doors enable easy indoor/outdoor circulation. An asymmetrical stone fireplace is a dramatic focal point in the open plan. 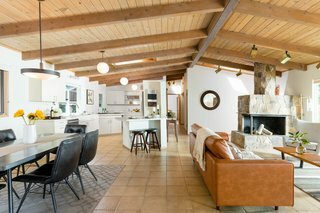 Tile floors with a radiant heating system make for a cozy interior climate. The bonus room can be screened off for privacy with a collapsible built-in room divider. 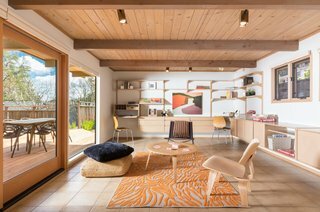 The bonus office/family room is lined with a chic system of wood built-ins that offer a lot of storage capacity. 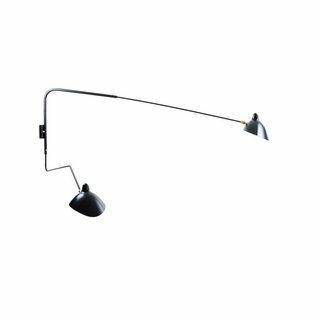 The simple white kitchen anchors the corner, with an eat-in bar for informal meals. 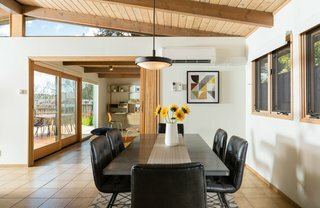 Skylights bring lots of natural light into the room, as well as circulation areas like the hall and entryway. 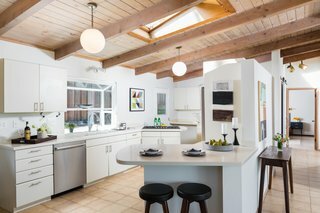 The kitchen includes solid surface counters, a gas cooktop, midcentury-style pendant lights, and a command center by the back door. 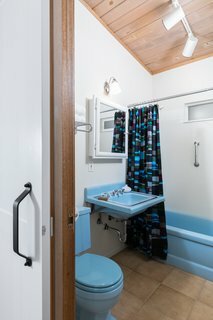 A hall bathroom with blue fixtures. The wood ceilings continue throughout the house. The master suite has a private patio. 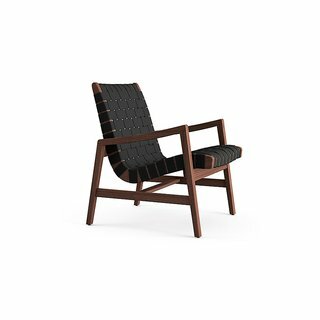 The Risom Arm Lounge Chair (1943), by Danish designer Jens Risom, is testament to the simplicity and ingenuity that is so often found in timeless modern furniture. 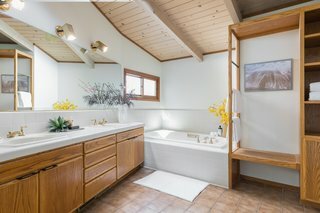 The master bathroom has a simple tile treatment and wood storage units. 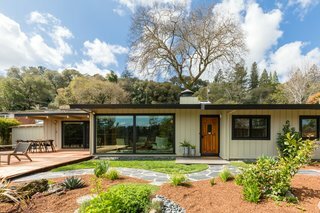 With its low-slung roof, wood siding, and generous eaves, the exterior delivers classic midcentury flair. 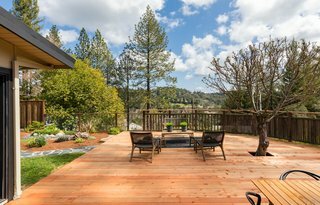 A redwood deck, easily accessed from the living areas, is a nice spot for alfresco meals or outdoor hangs, with views overlooking the hills and city lights. 19 Loma Vista Drive is currently listed for $1,175,000 by Ana & Pascal Forest of Red Oak Realty.